Stock photo of the exquisitely detailed Old Opera House, Alte Oper Frankfurt, and its fountain decorated with lights, at night, downtown Frankfurt, Hessen, Germany, Europe. The view of the Old Opera House and fountain at night, Alte Oper Frankfurt, Hessen, Germany, Europe. 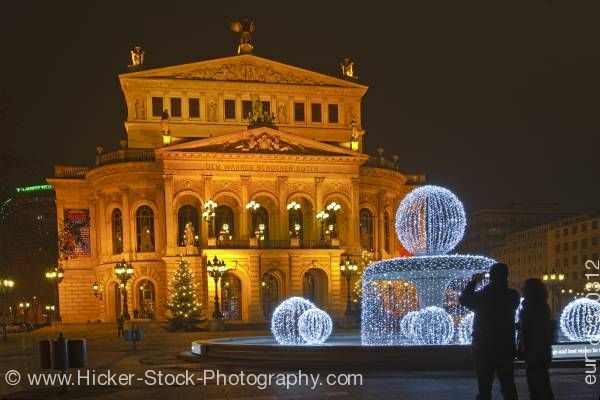 This stock photo shows a night time view of the Old Opera House, Alte Oper Frankfurt, and its fountain decorated with lights, downtown Frankfurt, Hessen, Germany, Europe. The Old Opera House is exquisitely designed four story building. The front of the building shows tall arched windows and doorways. The building is symmetrical in design with curved walls on each side of the facing of the first two stories. The second story has the classic columns between each arched window. The third story has a walkway with a railing and the fourth story has three sections of three rectangular windows with a statue between each section. The vaulted roof has a beautifully detailed carving. The water fountain in front of the opera house is decorated spheres with rows of white lights.